I recently had to assemble a content query web part (my least favorite thing) pulling data from a Calendar list and experienced hours of pain trying to get it to pull the locations field as well as the start/end time consistently. I share my pain so that other won’t have to endure, and hopefully some tips so that you can skip all the BS and just make a quick web part that should have took about 30 minutes. I had an extremely painful time working with the Location field for some reason. It would show on ctrl-f5 or the first load of the web part. Then disappear or show intermittently. It was basically unreliable until I used the ID and renamed the fields as described below. If you go to the list settings and copy or inspect the link to the Start Time field you’ll see something like this. Next search for DataColumnRenames, add the following. 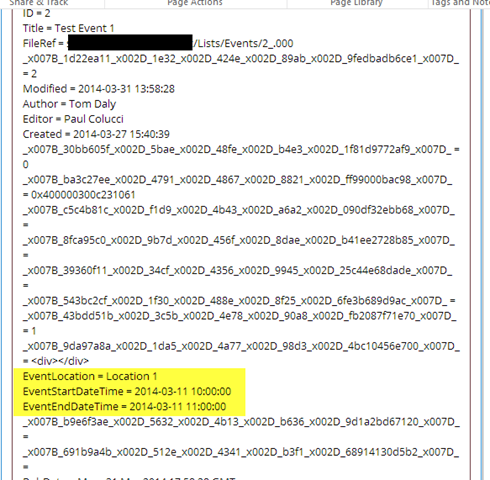 The EventStartDateTime is what you would use in the xslt to pull this property. You can call it what you like at this point. 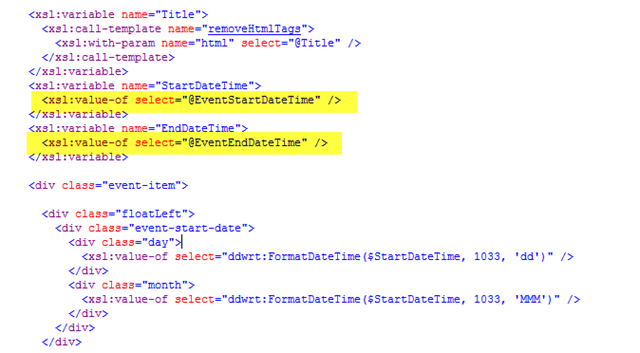 Below is a snippet of me using the EventStartDateTime in my xslt. I’m assigning it to a variable to i can further manipulate it. You can repeat the following steps for a fool proof method of getting the fields you want into your content query web part. If you use the column ID and rename it you should have no issues.